These handsome shirts stand out in vibrant color!! 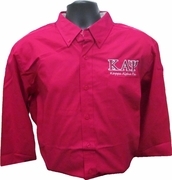 These long-sleeve shirts feature dye-to-match color buttons down the front placket, wrists, and shirt collar. These shirts are a warm 4.5 oz, and are wrinkle-resistant. Each features your greek letters and symbol, greek letters and full name spelled out, or fraternity crest. *Note - Because these shirts have a pocket over the heart, we are only offering the crest without the "Fraternity, Inc." underneath the crest. The fraternity name will be embroidered arched over the top.